Our library book sales are so huge and so well attended that people come three hours early to get numbered tickets for first dibs on the bounty. (It helps that you can preview online photos of the book shelves days before the sale.) Folks even drive down from San Francisco and from across the bay. 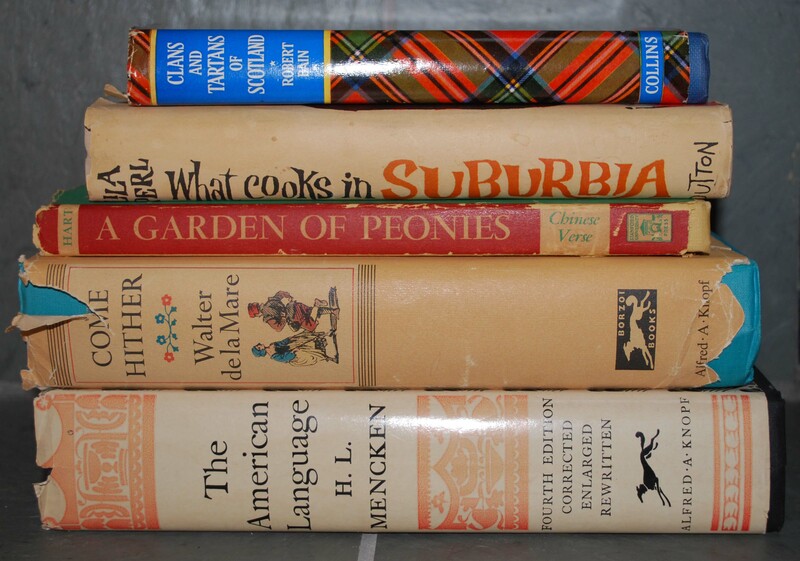 I entered the melee one Saturday with ticket #263 (alas, alas) on the hunt for vintage books for my Etsy store. I was convinced that by the time I was allowed to enter the building, the books I wanted would be long gone. The books I had on the list clutched in my sweaty little hands were still there. How could all these other book buyers not want H.L. Mencken’s classic tome “The American Language” (1962) or “The Drinking Man’s Diet Cookbook” (1967) or the 1955 first edition of “The Shaping of Our Alphabet: A Study of Changing Type Styles” by Frank Denman?? Fast forward a few months. I visit the sale once again, but this time well after the crush of bodies just to see what I could find. What might have been overlooked. I leisurely perused the cookbook section (I love vintage cookbooks! ), then gardening, mysteries, reference and poetry. Within 10 minutes I found “A Garden of Peonies” signed and inscribed by Henry Hart (1943) and “Come Hither: A Collection of Rhymes and Poems for the Young of All Ages” by Walter de la Mare (1957). Two incredible poetry books that I would be happy to have in my collection if I don’t sell them! And I found a delightfully quirky book – “Clans & Tartans of Scotland” – from which I learned that one of my favorite jackets is a Rob Roy tartan. I’m not looking for bestsellers. I’m not looking for current books…usually! Here’s my buying criteria: I’m looking for the old, the odd and the delightful.